These pickles are delicious. Incredibly pungent, and really flavorful. The batch above was actually my second; I tried this once with regular eggplants, and found they just had too many seeds. It stands to reason: Italian eggplants are much smaller and slimmer than the variety we usually get here in America. You can often purchase them here, but they’re pretty expensive. 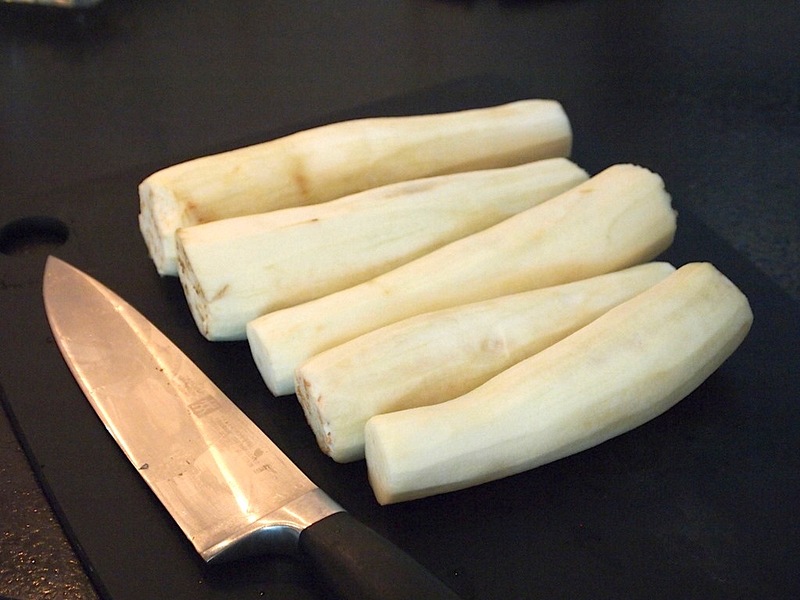 My advice: use Chinese (sometimes called Japanese) eggplants. If you can’t find them, use the regular kind, but try to find some modest-sized ones. I love to keep the skin on my eggplants when I’m roasting or grilling them, but that’s simply not doable with pickles. Peel those puppies down. A confession: I’m also usually lazy about salting eggplant. I know it’s supposed to take the bitterness out of the eggplant, but I usually cook this vegetable with flavorful sauces, and kind of enjoy the way the bitterness undercuts things. Again, not doable with pickles. 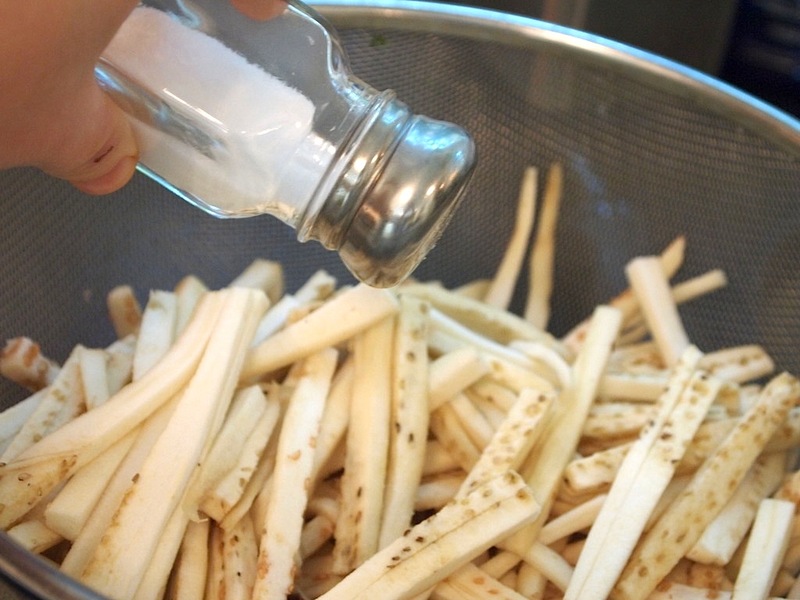 You have to slice these eggplants into matchstick strips and salt them. I didn’t show this above, but it’s also a good idea to put a weighted plate on top of the salted eggplant to really hasten the draining process. The more moisture you press out, the more vinegar the strips soak up, and the faster the pickle. 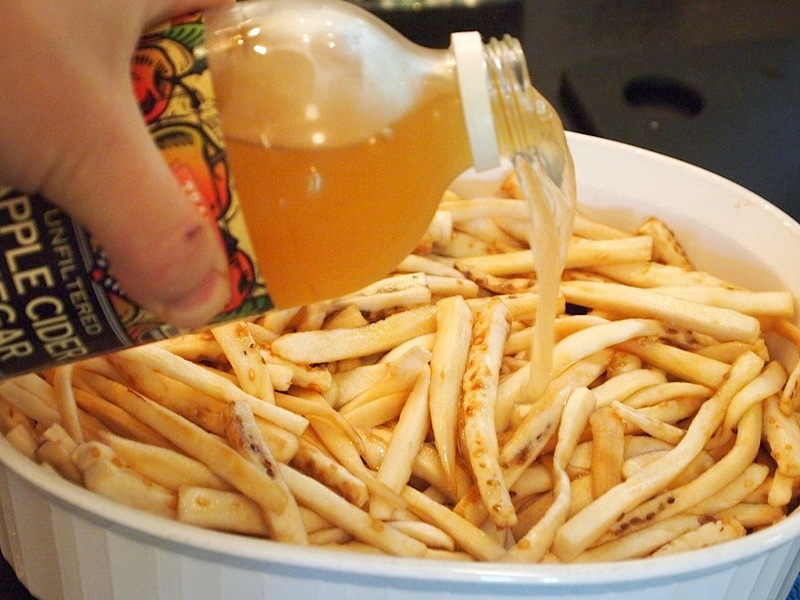 I’ve made this two ways – with cider vinegar and white wine vinegar. Both are fabulous. You’ll need to use a full bottle of whichever you choose. The real work is done now: you just let the eggplant soak for several hours. I like to stick around to turn it occasionally. This is the cool part: the vinegar breaks the tender eggplant flesh down, and basically cooks it. It’s like eggplant ceviche. 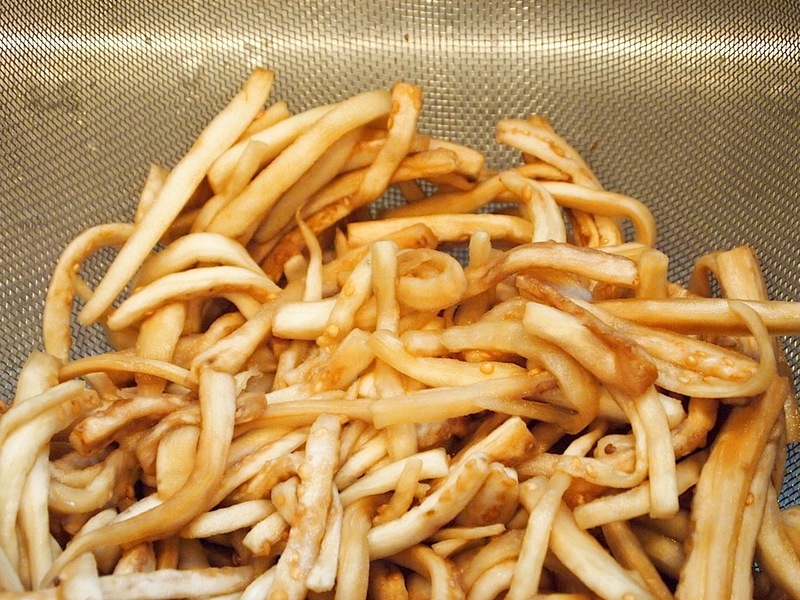 When the vinegar is squeezed out, you toss the pickled eggplant strips with garlic, herbs, and oil. I actually monkeyed with the traditional recipe here: Marie uses only garlic and bay leaves, but I decided to try tossing in some fresh oregano and red pepper flakes. Not to be immodest, but…I made a good call. The extra spices added dimension to the pickle flavor. Don’t use dried oregano for this, though – the herb has a very different character in its fresh and dried states. And then…I jarred and sealed it. A note about canning safety here: this recipe is not USDA-approved for long-term storage if you’re only heat processing (instead of pressure canning). I heat-processed because I was transporting this jar and didn’t want garlic oil all over my life. And because the heat cooks the eggplant a little more, and really binds flavors. You can make this recipe for short-term refrigerator storage and not seal it at all; in this case, just put it in a jar and let it mellow for a few days before using it. For longer storage…the USDA fear here is botulism. It’s your call whether you want to risk putting a jar up for a while. PS – I’m SOOOO done with the bar exam. Two days of testing in a cavernous convention center, and I don’t get results until November…but hey, I’m on vacation now! Lots of delicious things to come. 1. 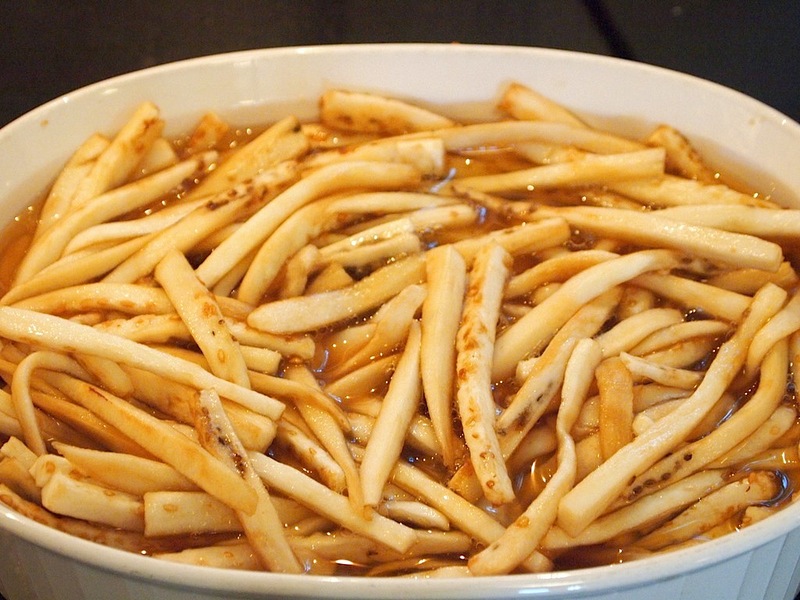 Soak sliced eggplant in cider vinegar for 3-4 hours. Eggplant should just be covered. 2. Strain eggplant and squeeze out all of the vinegar carefully. 3. Toss with olive oil, garlic, crushed bay leaves, and salt and pepper to taste. 4. Place in jar, add olive oil to cover, and place a whole bay leaf on top for flavor. Cover and keep in the fridge; try to wait about three days before digging in, to let the flavors meld. I love the choice of seasoning. Also, I can’t seem to think of enough potential accompaniments for this garnish. Woo hoo! The bar…done and dusted. I’m sure you rocked it like a hurricane. Well done! This pickled eggplant thingy is intriguing. I recently discovered that they grow eggplant year round in Cayman. I’m going to this plantation house event at some guy’s farm next week and I plan to load up on eggplant. Guess what I’ll be doing with a bunch of them? PICKLING, BABY! I’ve developed a huge love of eggplant and I’ve always loved pickles so I want to try this! Glad the bar is over for you. When do you find out the results? I never had those before..I generally love eggplants! Looks very interesting..and I am guessing delicious! Congrats on finishing the bar! This recipe looks delicious. I only wish I had it last summer when my garden was overflowing with eggplant. May have to load up on eggplants at the farmers’ market this weekend. I’m sure you rocked the bar exam! Congrats on finishing the bar! Now you can enjoy the rest of your summer and take a bar trip! =) I have never had pickled eggplant before but I think this is right up my alley. Bookmarking and buzzing! I am completely addicted to spicy pickled eggplant – we usually keep a jar of the stuff in the fridge at all times, for those nights when the most “cooking” we can manage is throwing a bunch of stuff on a plate and calling it antipasto. PS – Congrats on finishing the bar exam. Fingers crossed for good news in November! i never knew you could pickle eggplant…my mom always buys japanese/chinese eggplants, i’ll suggest this recipe to her – looks nice and refreshing for the summer! Great that you are finished your exam, Celia! Hope it all went well. I love eggplant and pickles so definitely trying this. Looks wonderful. Congratulations on the bar! 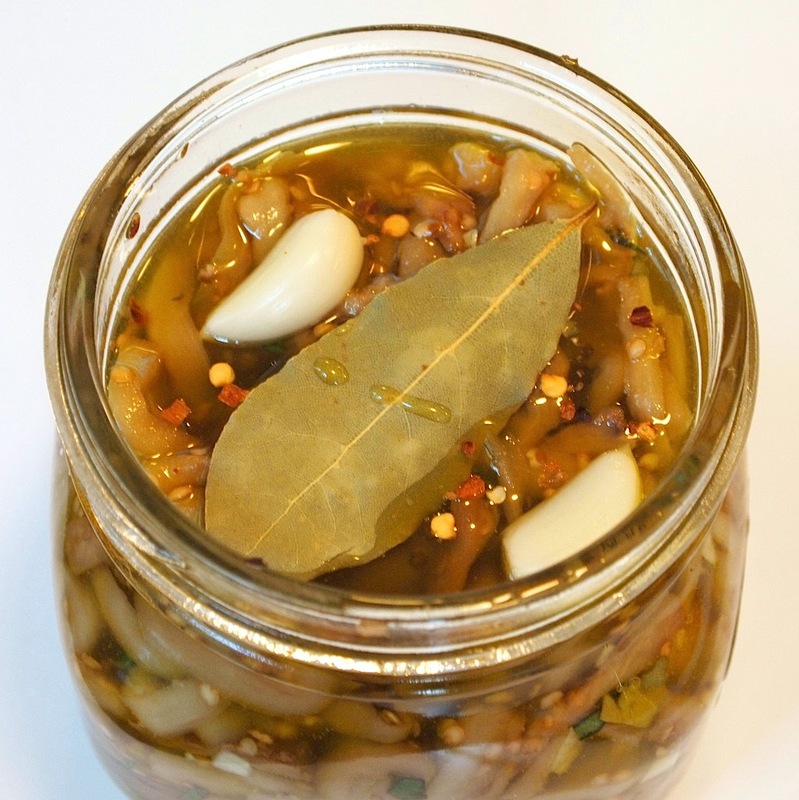 These sound great – I have been on a pickling kick lately so I’ll give these a try for sure. just bought some japanese eggplant because i saw your great recipe! it intrigued me so much to try it. question about the canning piece: can you waterbath can this or only pressure cook? and must feel awesome to be done with the bar! OK, yum. This looks so good. I love pickled anything, but I don’t think I’ve ever had pickled eggplant. Would love to try this. Nice! I’ve never thought to pickle eggplant but with the huge piles that keep showing up at our local market I’m thinking I’ll need to give this a try! Congrats on finishing the BAR!! I am your new friend from foodbuzz community. This antipasti looks great and I loved the flavours…what an amazing way to use up the eggplants!! I had picked several eggplants from my garden and started remembering the melanzane that we used to eat at our Grandma’s house. We used to make sandwiches out of it with homemade Italian bread that Grandma had made. I asked one of my cousins if she remembered it and knew how to make it. Yes she remembered it and loved it and no didn’t have a recipe for it. I asked my sister and she remembered it also and came up with your site and recipe for it. Well I made it and Mama Mia, it is sooooooooo delicious. Now I have to find a recipe for some good Italian bread because there is NO good bread where I live. Thanks for this wonderful recipe and putting substance to my memory!!! I am intrigued by this recipe. I may have to go find some small eggplant tomorrow. But when you say you heat processed it, did you pressure can it or water bath it? Oil normally means pressure canner but I do not own one yet. And congrats on the bar exam. But that is a long wait for results. @Mia – Thanks Mia! Glad you’re into the recipe. I meant water bath when I said heat processing; sadly, I don’t have a pressure canner either. If you want to be super-safe, just let the eggplant pickle in the fridge and eat it within a few weeks. It’s still delicious! 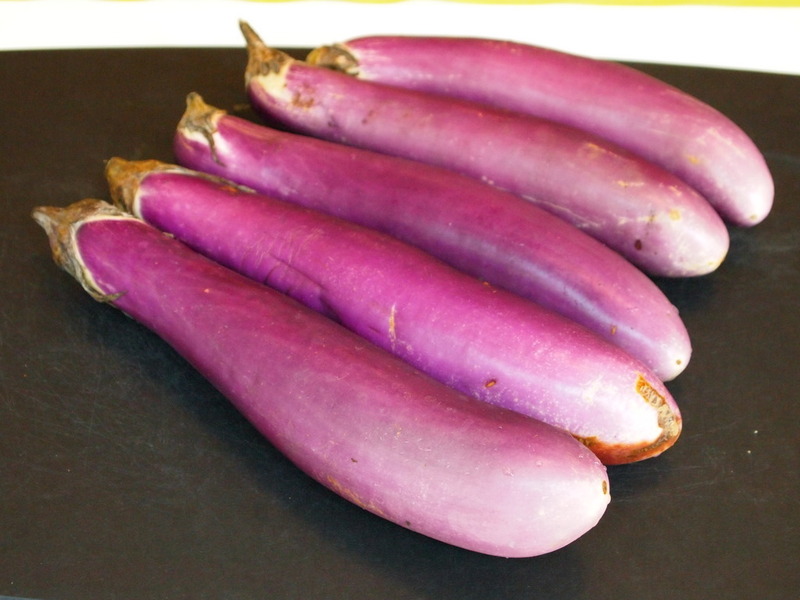 @ArchaeoCook – I will get some eggplant this weekend and try it. I have a curry picnic to go to on Labor Day and it would be perfect for that crew. And I am looking at getting a pressure canner hopefully Friday if I can find the one I want for the right price. Time to break down and spend the money on it I guess. Grazie! 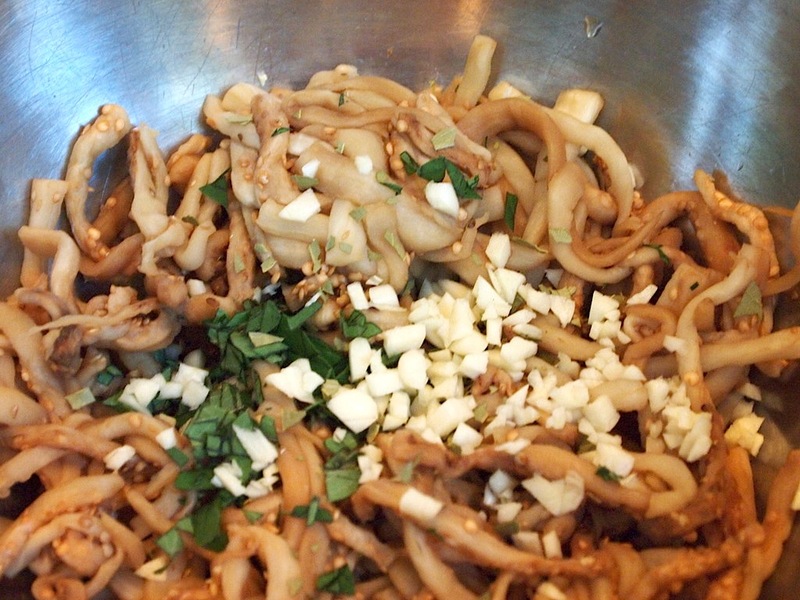 I ate these often in Italy and am glad to have a recipe. My friend would get them from her Sicilian relatives. I planted some Ichiban eggplant which is putting on a crop. Let’s try this. my grandmother’s recipe called for fresh mint. I’ve never had it any other way… But I think I will play with other herbs. This sounds very amazing! I wonder if they’d be good fermented, it’s temping to try!